Where Does The Efficiency Come From? Efficiency stems from two aspects of our home design: the shape of The Haven®, and smaller energy systems needed to maintain The Haven®. Efficiency begins in production. The interior 1550 sq ft is entirely enclosed by 40 interlocking, 12′ sided triangular panels. These 12′ panels are manufactured at this size specifically to maximize the use of standard materials, 8′ and 4′. 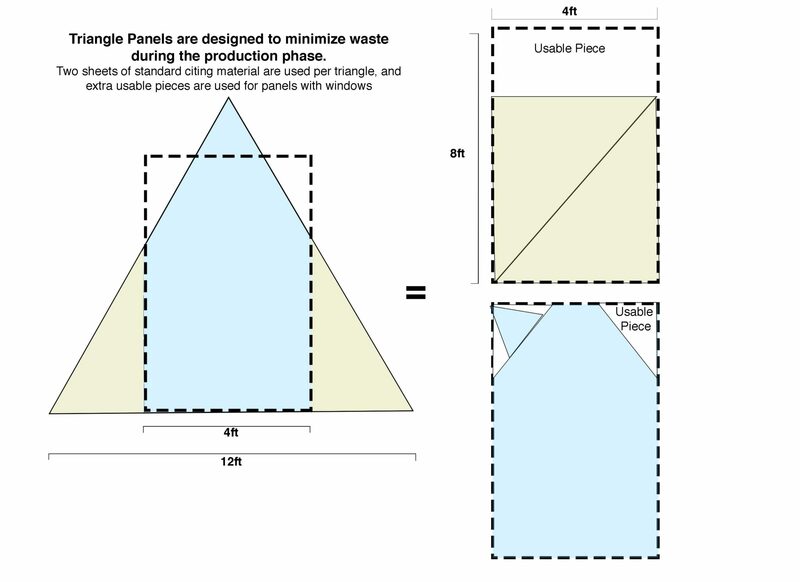 The Haven™ design lends a virtually waste free production process. Next, the erection of these 40 panels into The Haven® shell is quick and efficient (up to one week), eliminating material and resource intensive on-site construction. 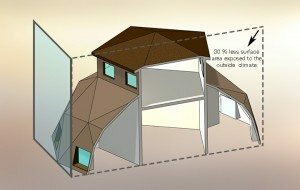 This shell encloses the entire 1550 sq ft home using 30% less material than a conventional rectangular shaped house of the same square footage. Thanks to the hybrid geodesic design, The Haven® allows for a 30% reduction in overall surface to air ratio. A lower surface to air ratio means less outside influence affecting the interior climate of your home. Once the home is built, The Haven® then begins its next stage of efficiency: maintaining a temperate interior climate. Energy efficiency is first maximized by the low surface to air ratio of exterior walls thanks to the dome-like shape. This means that there is less square footage that has contact with the outside climate, which in turn means less direct heat exchange. Overall, this means a much smaller HVAC system. Low Cost and Low Energy!